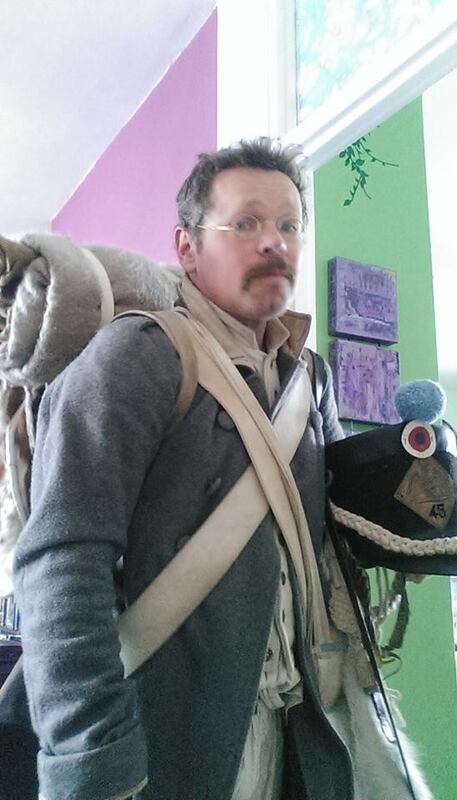 Left foot forward (a journey into reenactment): W a t e r l o o, part one! W a t e r l o o, part one! Where to start? narrative or vignettes? Bit of each, so back to the beginning.. Le voyage! naturally it was a warm day as I set off with everything packed into just my pack and a breadbag, although this did mean wearing the biggest item of clothing, the greatcoat, over which I had my bayonet crossbelt, giberne, canteen and breadbag, and of course musket bag to carry. I would be marching at a slow pace in the warm weather, but would still arrive on time. I needed to book somewhere to stay in Dover at quite short notice and did so at 'Dover packpackers' which is actually in a pub that Arthur Wellesley used as an office when overseeing troop embarkations in 1793. Nice little connection there for the start of my own voyage. Adequate but no thrills accomodation to be sure. Met John Flapjaques and Bob next morning. no trouble on the ferry, they must have constantly had people taking guns over for a few days. Only hic-up was missing the ring road and driving through centre of Brussels, where any form of road sign is few and far between, or occasionally just blank. 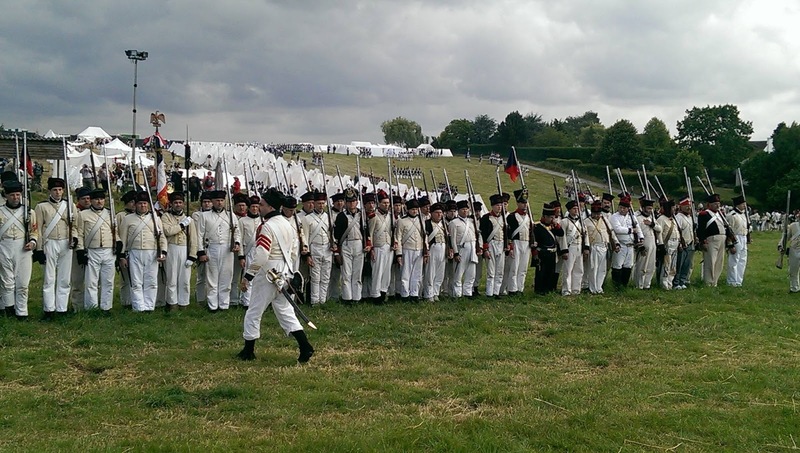 In England Waterloo is the most famous Napoleonic battlefield and to look across it in the evening light and pick out features like the reverse slope and see Le Belle alliance and Le Haye sainte was quite poignant. I have always felt that some trace of events yet echoes in places like this. 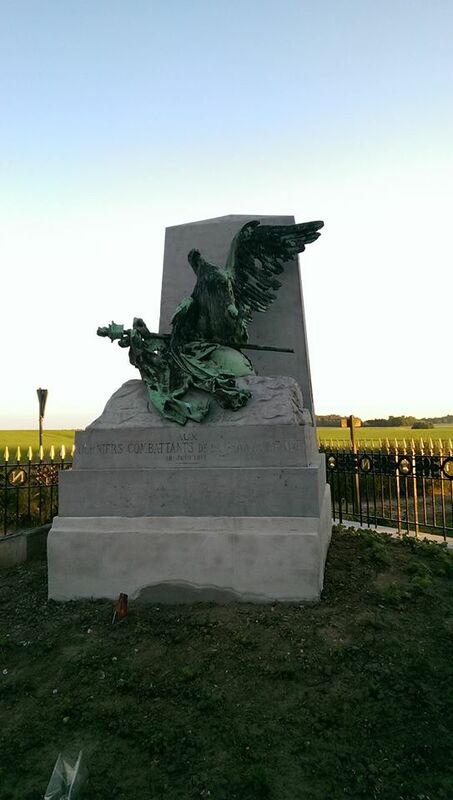 Below is the wounded eagle monument where the Imperial Guard made their last stand as the army was retreating. This is all Napoleonic hallowed ground. However sight seeing was to continue next day as nothing 'official' was happening until Thursday and only the first wave of the regiment was here. First though was unit shopping at Carrefore.. I was put in charge of getting cheese, cold sausages, apples and biscuits for 24 people for two days, crisps were also mentioned but I might have accidently-on-purpose overlooked them because I knew what would happen.. I have a thing about crisps in normal life.. so the thought of people in our camp or even on the battlefield waiting for the off to be eating crisps, unthinkable! Sure enough though the organisers gave us some food as well.. including crisps (and bizarrely tinned fish) and when the packlunchs were given out there was immediately a couple of people who started grazing and just plonking the packets on their plates with all these people who had come to see an authentic camp, I lightly suggested covering them over but those concerned were too busy chewing to do much more than shrug. 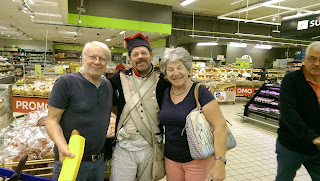 The shopping was halted several times by questions and locals wanting to pose for photos. Additional supplies for myself were purchased, not including the offical big cheese of Waterloo, but did include some lovely Normandie Calvados. Supplies delivered, some of us went to the visitors centre, newly redesigned for 2015, a great place and just 2e for reenactors. There was a gallery of painting where smoke, snow, or sand moved across or the painting itself scrolled across the scene. Lots of uniforms and a set up of the Marshals at the battlefield HQ, relics and interactive maps.. and a giftshop, might as well get the T-shirt if your going to fight the battle. Then we climbed the Lion mound for a panoramic view and I had my first of several interviews with a French news team, just next to some (proper) Belgian soldiers who were quite friendly and looking out for Prince Charles, Putin, and half the Belgian royal family who were dropping in that day, kicking many of the allies out of their own camp until they had gone. This day was the 17th and I decided it would be appropriate to sleep outside for this one, as so many thousands had on that night, fortunately it did not rain.. quite so much. Up early for drill, first by pelaton (platoon), then division then battalion.. I'm not sure why a smaller grouping is called a division and the larger a battalion.. we were brigaded with a Norwegian regiment in red coats and either bearskins or Corsican hats and their Captain (Erich) had to quickly interpret what an Englishman was saying in French into Norwegian and pass the order on. There were some difficulties as they have a faster marching pace than us.. with orders of 'Mush!' for slow pace, 'Mush Mush!' for regular pace and 'Mush Mush Mush!' for charge. There grand chaps who we were camped with at Leipzig and have to line up for cod liver oil at medical inspection and have sentry duty run all through the night. As at Wollaton people made jokes and rolled eyes at some of the big maneuvers we had to practice which made it worse if it went awry and we had to hope the Colonel didn't make us all do it again. After a lovely lunch of vegtable soup I decided to visit Placenoit which was about a fifteen minute walk, as long as I could home in on the Church steeple. Here was some of the hardest fighting on the right flank as the Prussians arrived and there are a couple of monuments and damage caused by the battle can still be seen. A man in a grey suit seemed to be marching all around waving a big French standard and I was asked to be in a photo with it. 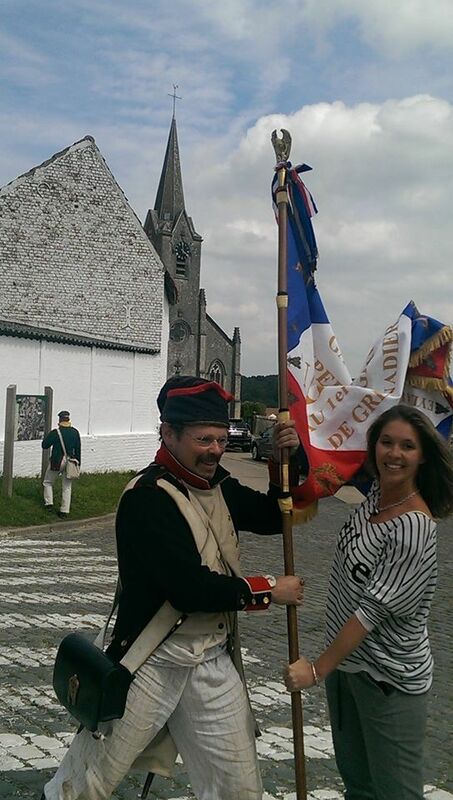 The Church can be seen in the background, and a Prussian, many of whom come to visit Placenoit. I then had some food in the cafe opposite when the man in the suit marched in, seems he was the mayor, and started waving the flag and singing French songs. I guess we know what side he's on! I don't know what the experience of the allies was but I got a real sense that the local people were much more pro-French in sympathy than with the British or Prussians, we had cheers and 'Vive L'Empeuers' and saw more French flags than any other, despite the Belgians being officially part of the allies. I would like to know what the soldiers felt at the time, the British distrust of them is well recorded and maybe that colours modern attitudes as well. In the shops there was Napoleon slippers, Napoleon cutlery, Napoleon chocolates, etc etc etc but not a Blucher coffee mug to be had for love nor money. That night was a big fireworks display with music and pageantry called 'The inferno'. (we weren't there) Sadly some of the reenactors involved were injured by pyrotechnics and that day the man who represents Marshal Ney was thrown from his horse and injured which would have repercusions in the battle next day. This was the 18th June. 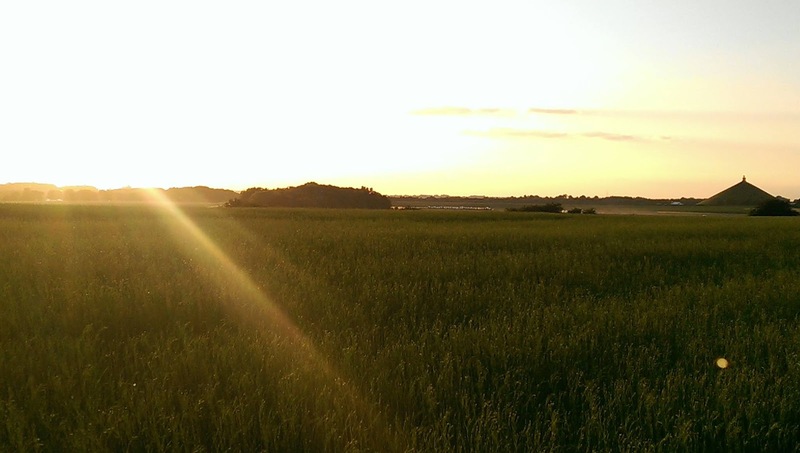 At various times I stopped to think of what was probably happening on the very spot I stood and as the sun set I thought of how the world had changed by nightfall and how the whole world was waiting to hear the outcome from one day in the wheatfields between two Belgian slopes.. Yet tomorrow we would march in those fields. W a t e r l o o, part Three. W a t e r l o o, part Two.